Chuckling, yet totally confused about how I was going to publish such imprecise sequence of culinary actions, I immediately called my mom for more detailed instructions. Later that week, my mom and I made this soup together twice to nail down the proportions. I promise you, this final recipe is pretty darn close to the soup that I hold vividly in my memory. 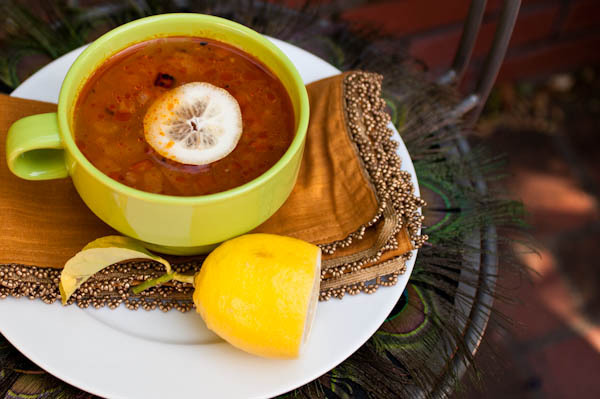 The popularity of this traditional Georgian stew has penetrated all corners of the former Soviet Union and, if you have never tasted Kharcho before, I assure you won’t be disappointed. 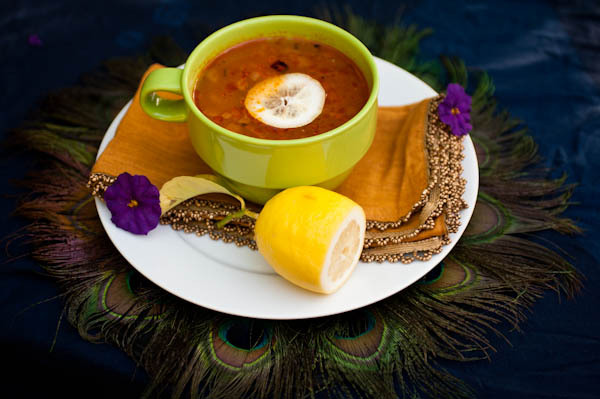 The combination of smooth and delicate beef broth with neutral rice, tangy lemon juice and spicy seasoning creates the taste and fragrance that are very characteristic of the soup. 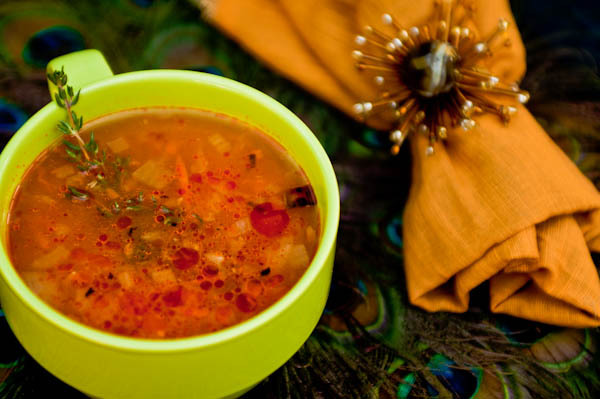 There are numerous regional variations of the Georgian Soup Kharcho, but I bet all the veggies in my fridge that my mom’s is the tastiest! 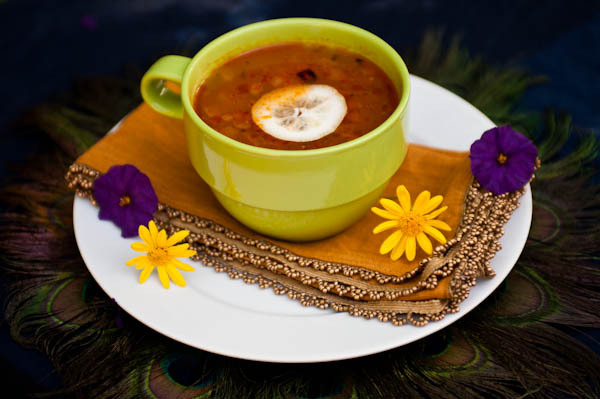 Note: Kharcho, like most stews and Eastern European soups, tastes best the next day, once the flavors settle. I like to eat it with or without the fresh herbs (depending on my mood) out of a large bowl, accompanied with warm and toasty garlic bread. In a large soup pot, bring the meat and water to a boil over high heat, skimming off the foam as it rises to the top. Reduce the heat and simmer, partially covered, until the meat is very tender, about 1 ½ hours. Remove the meat and cut into bite-size pieces. Add meat back to the pot. In the mean time, heat the oil in a skillet over medium heat. Add the onion, carrot and celery, and sauté until slightly softened, about 10 minutes. Blend tomatoes in the blender. Add to the skillet and sauté everything for another 10 minutes. Add potatoes to pot. Simmer for 10 minutes. Add sautéed vegetables to pot together with the rice, and simmer, covered, for about 10 minutes. Season with salt and pepper to taste. Add ½ the garlic and simmer for another 35-40 minutes. Remove the soup from the heat. Check the seasonings and adjust if needed. Discard the bay leaves. Add ¼ cup of the fresh herbs (my favorites are cilantro and green onions), ½ the garlic and lemon juice, and let stand for 1-2 hours. Right before serving, add the remaining fresh herbs to each individual bowl. I always thought that it also needed some pickles. You welcome to come and taste it. This is a great recipe. I tried it last week. My family and friends LOVED it!! This is really a good recipe. I’ve followed this recipe many times and loved it!